2018 Snow Blowers – Who Makes What? Craftsman, Ariens, Cub Cadet, Toro, Troy-Bilt, Snapper, Yardman, MTD Pro, Honda, Yard-Machines and MTD? Here is a list of snow engine brands followed by a list of snow blowers brands and who makes what. Snow Engines – Who Makes What? There are five manufacturers of winterized engines currently being installed on the snow blowers I am going to review this season. Every one of the brands has a proven record of reliability. In fact, in the last two years, all of these motors have service records that are the best the industry has ever seen. Parts and service are easy to get from the dealer or retailer you purchased it from. They are designed to run on today’s fuel (Do NOT use E-15 or E-85) AND HAVE MUCH LOWER EMISSIONS than motors sold just a few years ago. One of the most common questions this year is: Where is the engine made? PowerMore™ OHV Winterized Engines: This motor is usually labeled the same as the snow blower it is mounted on. In other words, if you buy a Craftsman snow blower it will be labeled as a Craftsman engine. Cub Cadet, Troy-Bilt, and Yard Machines engines are PowerMore. All PowerMore engines are warrantied through the snow blower brand they are mounted on. Loncin: Toro’s Premium Engine is made by Loncin, one of China’s largest motorcycle manufacturers. They make their 87cc, 99cc, 163cc, 212cc, 265cc and 302cc engines. Like LCT and Powermore the reliability is way up compared to your old Tecumseh or Briggs engine. Honda: No I didn’t forget about Honda. They only install snow motors on their own brand. According to the latest info I have these engines are made in Thailand. Tecumseh: Lawson Power Products (Tecumseh:) quit making engines in 2008. LCT has partnered with them and is now using the technology and brand names from the old Tecumseh product line. Snow Blowers by Brand: Who Makes What? Ariens actually makes 7 different series of single and 2-stage snow blowers but for most of us Sno-Tek, the Ariens Compact, and Ariens Deluxe will be the models we will buy. The Platinum, Pro, and Track series are high-quality snow blowers designed to last a lifetime. I will make a point of reviewing all of the Ariens snow blowers at Home Depot so you can compare them to the other brands. All of these are made in the U.S.A.
As you most likely know Stanley, Black & Decker (SBD) purchased the Craftsman name this year – but not the products. What that means for snow blowers is Stanley, Black & Decker will be independently developing their own line of Craftsman snow “throwers”, parts, and repair network. Because of that, I will explain the three different Craftsman snow thrower lines available this year. Craftsman at Sears is the name and products you know. Snow Blowers are sold through Sears.com and your local Sears store. All the parts, warranty repairs, and service are the same as before through SearsPartsDirect.com and Sears Repair Services. Sears Hometown Stores is independently owned and separate from Sears and Stanley, Black & Decker. Currently, they carry most Craftsman (at Sears) snow blowers and the residential series Husqvarna. You can view snow blowers on the Sears Hometown Stores website but you have to go to your local HomeTown store to purchase them. They will offer you a purchase or lease option. NEW BRAND! Craftsman At Lowes, ACE. Craftsman.com, etc. As you most likely know Stanley, Black & Decker (SBD) purchased the Craftsman name this year – but not the products. What that means for snow blowers is they will be independently developing their own line of Craftsman snow blower, parts, and repair network. It is unclear if they will have the snow blowers made by the current manufactures or build their own in – in their own factories in the future. The models currently listed on Lowes.com are made by MTD. WHO SHOULD I CALL FOR PARTS & REPAIR? If you are in need of parts and/or repair for your CRAFTSMAN product, please call our customer service line, 888-331-4569. WHERE CAN I GET MY TOOLS/EQUIPMENT REPAIRED? For all repairs, call 888-331-4569 or email us at craftsman@sbdinc.com and we’ll handle all your repair needs. With proof of sale, call this number to obtain the warranty coverage stated below: 1-888-331-4569. They are a U.S. based manufacturer and the majority of the models are made and assembled in the U.S.
All Honda single-stage machines for the USA and Canada market are manufactured at the Honda plant in Swepsonville, NC. This includes the entire engine, from casting to final machine work and assembly. I believe Honda is the only current USA-market snowblower manufacturer who makes both the engine and snowblower at a USA factory. Starting in May 2015 all Honda 2-stage snowblowers for the USA and Canada market are manufactured at the Honda plant in Swepsonville, NC. Husqvarna has both single stage, residential 2-stage, and landowner 2-stage units. Toro has a complete line of single, 2-stage and heavy duty 2 stage snow blowers. Most are made in the U.S.A. but some are made in Mexico. I am calling the rest of this list and any other brand not listed “specialty” snow throwers. Almost all of them are made in China. At this time I don’t know which of these names are manufactures and which are brands named just for the U.S. market. These brands either have only one or two models (most are small electrics) or are internet only companies. These companies all have the potential to be great, but for the time being be sure you understand the return and repair policies. In other words, a 2-year warranty is great but if you can’t find a dealer, an address to ship it to, or even to get someone to answer your phone call the warranty is worthless. Each Order of 50 Or More Comes With Free Shipping Container! Amerisun Inc. The parent company for Power Smart and Snow Devil. 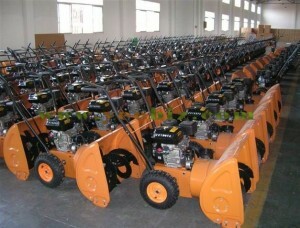 This company is coming on strong with their China built snow blowers. You can call them and get parts. They are currently building a nationwide service network. One last word of warning. If the price seems to good to be true – it probably is. Be extremely careful of 2-stage snow throwers selling for less than $600! Or for that matter any snow blower selling for hundreds less than the brands you recognize. If you don’t recognize the brand there is a more than likely chance the snow thrower is made in China and service, parts, and repairs for it is non-existent or at best weeks away. Be very careful about buying used. Like boat motors, these older engines are very susceptible to problems with today’s fuel. In addition, parts for the actual snowblower may be impossible to find. Snow blowers have gone through many different design changes in the last 50 years and they still have a ways to go. The designs vary from a simple scoop and fan, to a “sidewinder,” to the current design. There have been many different variations of the 3-stage design and some worked – and some don’t. I have Americana 523 snow blower and like to know who is the manufacture of it. I need some parts for the blower. thanks. That appears to have been made by Noma Corp. They’ve been out of business for at least 30 years. In addition, Tecumseh engines are no longer around. What that means is new parts, diagrams, or parts lists are not available. The only way to get parts would be to find another one and use the two to make one. Dear Paul, just bought a cud cadet 2x 30” snow blower, 2019 model. Cannot find anywhere to get spare belts and shear bolts, can you help? Hi Brian, I strongly recommend buying original replacement parts from your local Cub Cadet dealer. You can find your dealer by going to cubcadet.com and then the dealer locator tab. You can order online through MTD parts: Sign Up For Our Newsletter & Save 10% On Your Next Order at MTDParts.com! Coupon Applied After Sign-Up. I’m looking at a Land Mark snowblower which is for sale, could you tell me who manufacture this type of snowblower? Hi Claude, It was made by MTD, Noma or Gilson. Either way, there are no parts available for the snow blower and very few for the engine. The only way to find parts for it will be to find a second one to use for parts. Thanks Paul. I was looking at the Power Max 824 OE or the Toro Snow Master 724 OXE but you got me thinking about the Craftsman 88640 and the Black Friday Sale. Do you think the Craftsman is the way to go? Hi Dave, I’m not recommending Craftsman at this time. I just don’t know where the company is going with the bankruptcy. Hi Paul, Thanks for this very interesting article. I see you mentioned MTD makes these snowblowers to company specs. My question is are the 420cc Powermore engines spec’d out the same on the Craftsman Pro Series as they are on the Troy-Bilt Artic Storm 2x models? Are they going to throw the same? RPM’s the same? The Craftsman has a crank chute control and front LED light. The Troy-Bilt has the electric chute. Otherwise they are the same in every way. Hi David, No, they are the same snow blowers with the same model numbers. In fact, if you buy a 2-stage Toro through one of my home Depot links it will most likely be taken out of your local dealers stock and set up by them. If you opt for delivery it will be delivered by your local dealer. hi Paul, live in north jersey, mostly 6″ snow storms, with 3 or 4 in the plus 12″ range. question? Ariens or Cub Cadet. The 3x CC is selling for the same price as the 2x CC. also the Ariens deluxe 24 is the other choice. Hi Mick, Interesting the 3X is the same price. Is it a smaller snow blower than the 2X? If it has a black dash it is an old model. It’s normally $300 more? That said, my first choice is the Ariens Deluxe 24. It throws all types of snow well and is very easy to use. 2nd choice is the 2X. It will handle your snow and do a good job for you. It doesn’t throw snow quite as far as the Ariens and will plug up on heavy/wet snow. Finally, the 3X likes 12 inches or more of good snow. It will clog on the wet stuff and anything under 4 inches it splatters it all over the place. Hi Steve, I’m going to suggest you go with new. Why? I am going to assume you have the 2410 which have a habit of being hard to start. Upgrading to the 2018 model Troy-Bilt Storm 2460 at $699 will give you the new airless tires which I like a lot, the new quieter engine that starts well, and the long chute. The gearbox for the auger on my 6 years old 24″ Troy Built Storm failed and has to be replaced. I’m assuming it’s my fault, since I stupidly replaced a shear pin with a nut and bolt a few years ago. The local shop wants $250 – $300 (parts and labor) to repair it. A new one cost about $600. I don’t know the life span of these things . . . so do you think I should repair or replace. Many thanks for your help! Do you think I will be happy with this one? Hi Sue, The Yardmaster is one of the Chinese snow blowers. Mechanically, it duplicates all the good features of the Amercian made machines but it’s greatest weakness is the parts and service network. There is none. If you are mechanically inclined and can do all the repairs yourself you can order parts from YardMax. Warranty parts they’ll send to you. I strongly suggest that you buy a spare impeller belt now so if it breaks you don’t have to wait weeks to get a replacement. Hi Paul, I was considering buying the Cub Cadet 208cc, OHV 4-Cycle 2-Stage 24 in. gas snow blower with joystick chute control but notice a lot of negative comments on the joystick. When I see this unit in different stores, the joystick is often broken. Now I am hesitant to buy this unit. I am also considering the MTD Gold 24″ 208 cc 2-Stage machine with steerable wheel drive and easy crank chute. Your thoughts and opinions please? Hi Pete, The ones on the sales floor are probably not broken but there are three things that can happen with the joystick to make you think it is. 1. People don’t know how to use it. 2. People don’t know how to adjust it. 3. People, especially the kids who assemble it at the big box store, don’t read the directions when they assemble it. So, 1. Watch this video: How To Use 4-Way Chute On Craftsman, Cub Cadet and Troy-Bilt Snow Blowers. 2. When it’s assembled the first time make sure the control angled to the right a little (like the video) when the chute is pointing straight forward. Be sure to grab it the way I show you in the video. It’s actually called a Forearm Control – not a joystick. If you try to use it like a joystick it’s very hard to use. There is a friction wingnut out on the chute deflector. That controls the tension on the deflector. You adjust that for different types of snow. There is no adjustment for the side-to-side movement. 3. Read the directions before you install the chute. Make sure the joystick is lined up like shown in the video. There is actually a little arrow on where the connecting rod goes into the dash to help you line it up properly. The MTD and the Cub Cadet are the same basic snow blower but parts, service and warranty work are much easier to get for the Cub Cadet. Or, you can spend $899 and get the NEW 2X 26″ HP at Home Depot. It has a steel chute, crank style chute control, larger tires and the new dual LED headlights. Hi Jim, Hi Jim, a 24-inch snow blower is a good size for your driveway but you average a lot of snow. Because of that, I suggest a heavy duty 24 inch like the Ariens Platinum 24 or a Husqvarna ST324P. Both are dealer only snow blowers. I live in northwest Montana. The closest city to buy a snow blower is Sandpoint, ID where there is a Home Depot, Sears, Walmart, and an outdoor store named North 40. These all carry snow blowers. I want a 24″ and do not want anything made in China. I need a type that can be raised at the scoop as I have some gravel, loose rocks, and some uneven terrain. Am prepared to spend upwards to $700 or a little more if needed. Do know that the Walmart carries the Yard Machine brand… but I want a quality machine that will give service and not break down all the time and can’t find parts. Would appreciate your recommendations on what brand to buy. Thank you. Hi Bill, I looked at the inventory at the Sandpoint Homer Depot and they have 2 American made snow blowers that will last. The Toro Power Max 824 OE 24 in. Two-Stage Electric Start Gas Snow Blower @ $799 or the Ariens Compact 24 in. 2-Stage Electric Start Gas Snow Blower @ $899. On paper, they look the same but the Ariens has a little more capacity and larger tires. This may be a good choice if you gravel driveway is soft. The Toro has a great chute and won’t clog on heavy, wet snow. The PowerSmart they also have in stock is made in China and you have to order parts through their website. You can get parts for both the Ariens and Toro through any Toro/Ariens dealer and you can also order parts for the Toro through their website. Sears has the 88173 for $599 at a mall store. (I don’t know what the price is at a Hometown Store) You can get parts and a manual for any Craftsman here: Sears PartsDirect. I have a ariens st724 powered by a 7h/p ano king. Does LCT make a direct replacement for this engine ? Hi Ron, No one that I am aware of are making the old L-Head design but the new 208 cc may work well. Here is the spec page and you can check the mounting and crankshaft height dimensions. Hi Nick, I don’t know but I’ll ask B&S this week. I also don’t know if the engine on a Simplicity is different than the one on a YardMax. It will be expensive. If you can figure out the parts it will most likely cost a few hundred. I also suggest you search YouTube. Someone is always changing and making modifications and many people document their ideas on YouTube. Good write up on who makes the engines for the different manufacturers. Do you have any insight on who supplies the gearboxes for the different brands? Hi Ernie, I assume you are talking about the front gearbox. That is designed by the manufacture. Some are built in-house and others are contracted out. The Ariens uses a cast iron housing and originally was designed for a roto-tiller. The Toro box uses an aluminum housing but has hardened gears inside. The Toro box is so tough that they don’t use shear pins. Toro and Ariens also use the same box in their commercial models as they do in their mid-range models. The MTD box is protected very well by shear pins that break before the gear box is damaged. Hi, question for you guys … just purchased the cub Cadet 3X 26 inch snow blower from snowblower direct.com. … I live on long island where the snow conditions can vary from wet slush to powder.. I’ve never owned a snow blower before but figured this one would be ok… Anyone have any experience with this machine or recommend something different? Hi Josh, I haven’t used the 3X 26 yet. I have the Troy-Bilt version to test when I get snow but that won’t help you now. Consumer Reports likes the three stage MTD built machines a lot. They report that it clears their sawdust pile well. Reading the Home Depot reviews about 1/2 the owners who wrote in like their 3X 26. The other half have various complaints and mainly center around changing the rear shear pin, breaking shear pins, and using the 4-way chute. You may enter your question or comment here:: what do you think about the new sears pro series 3 stage 28″ unit. How would you compare to the ariens 28″ deluxe at HD. Hi Phil, If you tell me where you live and what type of snow you get I can get you closer to a decision. The Craftsman works well in deep snow but tends to splatter 2-4 inch snow out the front. The Ariens handles all snows well but is a little underpowered for really deep, heavy snow. I live in Northwest Indiana with a 16ft x 30ft driveway, and 4ft x 60ft of sidewalk. Can you recommend the best snowblower for <$600? Thank you! Garrett, There is nothing out there that will handle the lake effect snow of Northwest Indiana for $600. The cheapest 2-stage that will handle you area is the Craftsman 88173. The normal sale price is $679 but if you are patient over the next 3 weeks it may dip too $599. I don’t have the Black Friday sales but I expect it to drop 2 or 3 times between now and then. Paul, just found your site….fantastic! It’s time to get a new snow thrower, help! I have a driveway that starts as a 3 car at the garage entrance, narrowing to a two car by the street, by 70 ft long. Live in the suburbs of Minneapolis where anything from 2″ to 18″ is common. Budget is a concern, as I’d like to keep the price under $800. Considering Craftsman, Poulan or Cub Cadet, do you think one of these is best for me? Thanks. Hi Doug, a 24 inch is a good choice for you. Hi Paul I recently bought a Toro Power Max® 724 OE (37779). The salesman told me is has a B&S engine. Tonight I found out that the engine is made in China. I’m really upset because if I wanted a Chinese model I would have just bought a lower end machine. Should I take it back? Thanks in advance. Yaron, Your new snow blower does have an engine made in China. It is a premium engine designed by Toro for your machine. It is actually a better engine than the older models with a B&S. Both the Toro AND THE Briggs & Stratton snow engines are made in China. There currently are NO snow blowers engines made in the U.S.
Don’t take it back. You have a good engine and a good snow blower. Hi Pete, You can raise just about all of the two stage snow blowers to give you about a 1/2 inch gap under the scraper bar. We raise them up when clearing gravel so they don’t throw rocks and on turf so you don’t tear up your lawn too bad. You raise them up by Lowering the skid shoes on each side of the front auger housing. Most of the brands like Ariens either come with poly skid shoes or have them as an option. The ploy shoes won’t scratch your driveway. MTD (Columbia, Cub Cadet, Troy-Bilt) have a universal set that fits most snow blowers.